Tiny sharks in South East Asia have helped scientists to understand the origins of glowing shark species. A number of deep-dwelling sharks have special light-emitting organs on their undersides that allow them to glow. A study of pygmy sharks now suggests the ability to control the trick evolved from a shallow water ancestor. Dr Julien Claes from the Catholic University of Louvain in Belgium led the research. According to Dr Claes more than 10% of currently described shark species are luminous. Scientists refer to the glow as “counter-illumination”: without it, anything looking upwards for a meal would easily see the sharks’ bodies silhouetted against the bright sky above. Previous studies have shown that lantern sharks, named for their glow, also use this ability to communicate. By producing a hormone called prolactin, the sharks can exhibit bursts of blue light, which they use to communicate with others in dark water, where visual clues are minimal. In order to compare the ability across species, Dr Claes chose to investigate smalleye pygmy sharks. 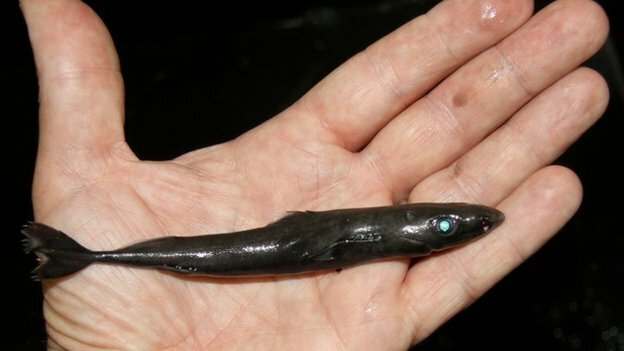 The diminuitive fish measures just 22cm long and is one of the smallest shark species. At night the tiny sharks swim at depths of around 200m, moving down to 2,000m during the day. During his analysis Dr Claes discovered a significant difference between the pygmy sharks and their larger cousins. “The hormone prolactin – that triggers light from [lantern sharks] – actually had an opposite action in the pygmy shark, switching off its luminescence,” he explained. Dr Claes suggested that the apparently less advanced glow control in pygmy sharks provided a clue as to how the ability evolved. “It is likely that the control of shark [luminescence] evolved from the [camouflage] of shallow water sharks,” he told BBC Nature. Sharks in shallow seas can fall prey to threats from above, but as a defence they are able to vary the colours on their skin to blend in with their environment. By producing different hormones, they can trigger darker and lighter patches of skin and, Dr Claes explained, this is the basis for deep sea species’ glowing control. For both smalleye pygmy sharks and lantern sharks the light-emitting organs glow constantly, but by triggering the light and dark coloured skin patches over them, the sharks can effectively switch this light on and off. “This result is very important, since it gives clues to the evolutionary pathway taken by a soft-tissue phenomenon which leaves no or extremely few fossil tracks,” said Dr Claes. Photon Hunting in the Twilight Zone: Visual Features of Mesopelagic Bioluminescent Sharks: here. ScienceDaily (Apr. 27, 2012) — Many shark populations have plummeted in the past three decades as a result of excessive harvesting — for their fins, as an incidental catch of fisheries targeting other species, and in recreational fisheries. This is particularly true for oceanic species. However, until now, a lack of data prevented scientists from properly quantifying the status of Pacific reef sharks at a large geographic scale: here. One common sea worm has a rather uncommon trick: Chaeteopterus variopedatus – also known as the parchment tube worm for the paperlike tubes it builds for itself and lives within throughout its life — secretes a bioluminescent mucus that makes it glow blue: here. This entry was posted in Biology, Environment, Fish, Invertebrates and tagged sharks, worms by petrel41. Bookmark the permalink.